Mahamadou Issoufou has been a fixture on Niger's national political stage since the beginning of multi-party democracy. Born in 1952 in Dan Daji, in the Tahoua region of Niger, Issoufou is a mathematician and mining engineer by profession. After studying in France in the 1970s, he began his career working for a French mining company in Niger. He helped establish the Nigerien Party for Democracy and Socialism – Tarayya (PNDS) in 1990 and left the mining company two years later to embark on a full-time career in politics. In Niger's first multi-party elections in 1993, Issoufou lost to Mahamane Ousmane, who became Niger's first democratically elected president. 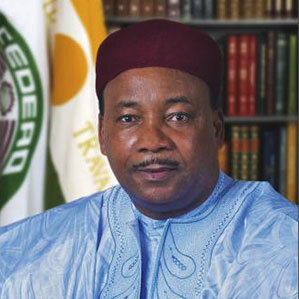 Issoufou served as prime minister in the Ousmane government until his party withdrew from the ruling coalition. From 1995 to 1996, he was speaker of the national parliament. Issoufou finished second to President Mamadou Tandja in the1999 and 2004 elections, emerging as the country's main opposition figure. He led the campaign to prevent Tandja from extending his rule beyond the constitutional limit of two terms. Tandja was deposed in a military coup in 2010, and Issoufou won elections organised by the military junta in 2011. After a controversial second round of the runoff election on 20 March 2016, Mahamadou Issoufou was re-elected for a second mandate. He gained 92.98% of the vote, with an estimated voter turnout of 59.79% (compared to 66.8% during the first round). Issoufou's rule has been dominated by security concerns, with the military confronting jihadists based in northern Niger, Mali and Libya as well as the Boko Haram sect in Nigeria. His political prowess and survival instincts have earned him the nickname "Zaki", the Hausa word for "Lion".